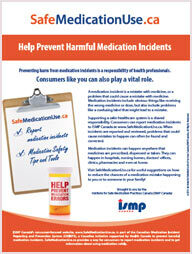 SafeMedicationUse.ca consumer brochures are now available! 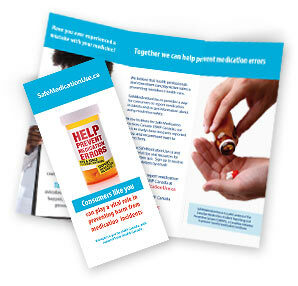 This brochure is designed to educate consumers about the SafeMedicationUse program and the important role of consumers in preventing mistakes in health care. To request a free trial supply of brochures or posters to display in your consumer or patient waiting area, contact ISMP Canada. View a pdf copy of the brochure English, Français.